In the tropical and subtropical areas where the species presently occurs there a large number of generations per year; there is no diapause. BE Mines, but no living animals, have recently been found (Snyers, 2007a). NE Not long ago an accidental introduction of this species was reported (Romeijn, 1997a), but is is not clear whether this involved moths, larvae, or just empty mines. In 2003 two Moroccan tangerines were found by Ben van As with mines in their peel. In 2008 my wife Albertine found a mined leaf in a batch of Spanish oranges with a completed pupal chamber, from which the remnants of the exuvium were protruding. LUX no records (Fauna Europaea, 2008). In Europe established in the Iberian Peninsula, Corsica, Italy, and Greece (Fauna Europaea, 2008); also Montenegro (Dimic, Spasic & Peric, 1997a). 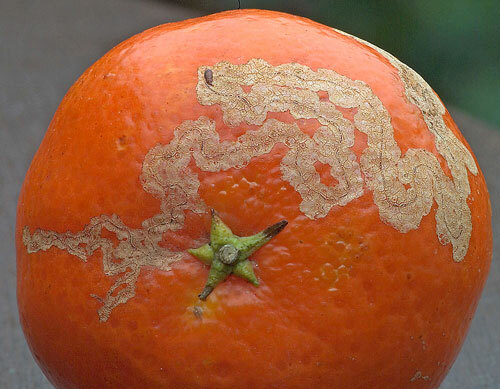 Elsewhere in Europe sometimes vacated mines are found on citrus fruits of leaves (Homan, 2005a). 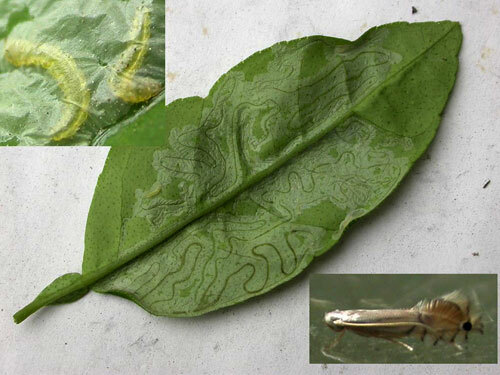 Recently a larva was found on a lemon tree in a garden centre in the UK, and successfully reared (Homan, 2012c). The species seems to be native to Asia,but is found now in all regions where Citrus species are cultivated. Dimic, Spasic & Peric (1997a), Homan (2005a, 2012c), Huertas Dionisio (2007a), Kirichenko, Augustin & Kenis (2018a), Nel (2003a), Romeijn (1997a), Snyers (2007a).